Assignment 2 enables you to create a multi-view navigation-style app, with many levels of navigation (list, detail, add item). Also enables you to get hands-on experience with the iOS table view infrastructure, and introduces you to models, the “M” part of the MVC pattern. 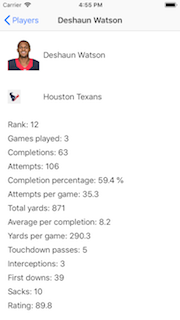 We need an app that will display performance information for quarterbacks in the current 2018 season in the National Football League. 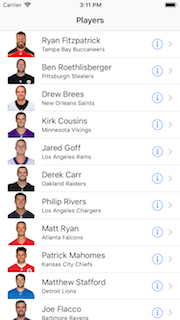 The app’s first view will be a table view, showing a list of quarterback names. Two more views will be available. One view will show personal info about the player, while the other will show performance-related info. The following shows the navigation path from the list to the first “personal info” view. The following shows the navigation path from the list to the “performance info” view. 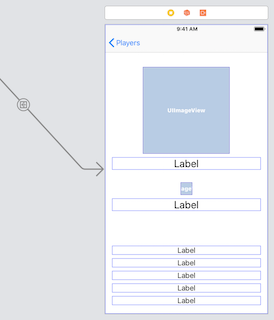 Create a new iOS app, using the Single View Application template. The name of the app should be “Players”. On the project settings editor, choose “11.0” as the “iOS Deployment Target”. That way you can edit your work on other College Macs. On the target settings editor, we suggest that you un-check (clear) the “Landscape Left” and “Landscape Right” checkboxes. The app will work only for portrait mode. The first part of the setup will be similar to what was demonstrated in the September 26 class. The template-provided view controller and scene cannot be used in this app. Therefore, in the project navigator, delete the ViewController.swift file. Next, select the “Players” folder item near the top of the project navigator, and create a new file (Command-N). It will be a Cocoa Touch Class. Next, make it a subclass of UITableViewController. In our September 26 classroom session, your professor suggested that the names of your controllers do not need the words “table” or “view”. Here, we go further - there’s no point in the word “controller” in the file or class name, so just keep it simple - we want to control a list of players, so let’s just name it “PlayerList”. Show the storyboard. Delete the existing scene. On the document outline, in the table view controller hierarchy, select the “Navigation Item”. On its attributes inspector, enter a value for the Title property (maybe “Players”). Tuesday, October 2, then you must do so again. A data type problem was discovered, and corrected. data types were changed to “Double”. Alternatively, edit your existing source code. that will edit all matching strings in one task. Click one of the “Float” words. For both ways, ensure that you choose the “copy files” setting. The data is located in the “plist” files (QBInfo.plist and QBPerf.plist). The unique identifier (or key) for each data file is the value in the playerName key-value pair. Data model class source code files are included (QBInfo.swift and QBPerf.swift), and each describes the shape of each entity. The other source code files (QBInfoManager.swift and QBPerfManager.swift) hold data manager classes. Each data manager has a public property (sharedManager) that can be used as a reference in any view controller. Each also has a public method (allQBInfos() or allQBPerfs()) that returns an array with the requested objects (i.e. an array of QBInfo objects, or an array of QBPerf objects). On the storyboard, configure the table view scene’s prototype cell with a value for the reuse identifier, and then edit its controller code to match. The prototype cell style should be “Subtitle”, so that we can show two lines of text. The table view will allow TWO kinds of navigation (detail, and disclosure), so configure its accessory as “Detail Disclosure”. In the controller code, set the return value for the “number of sections” method to 1. Set the return value for the “number of rows” to the count of items in the array (which is the data source). // by using the UIImage(named:) method, e.g. 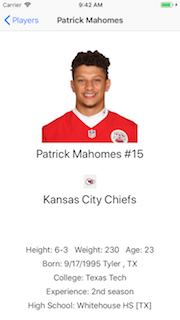 At this point in time, your app should display the data as a list of players in the table view. Before continuing, ensure that your app will display the list of players. Add and configure a DETAIL controller and scene. Reminder, this will appear only when a user taps the ⓘ detail accessory. Follow the guidance in this document to complete this task. What should appear on the view? 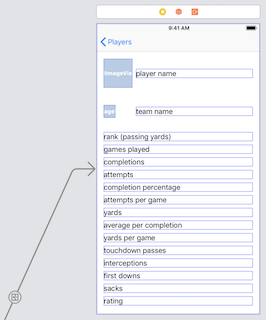 All data from the QBInfo object, except for the values in the “rank” and “teamCode” properties. As suggested by the sample screen capture, show the player’s photo in a suitable size. Use the value of the “teamCode” property to show the team icon. Add and configure a DISCLOSURE controller and scene. Reminder, this will appear when a user taps anywhere on a row (except on a detail accessory, if present). Locate your projectfolder in Finder (and we suggest that you make a copy of it for yourself).